The Access to Seeds Index was presented during the 7th General Assembly meeting of the Asian Farmers’ Association (AFA) in Hanoi, Vietnam on August 6, 2016. 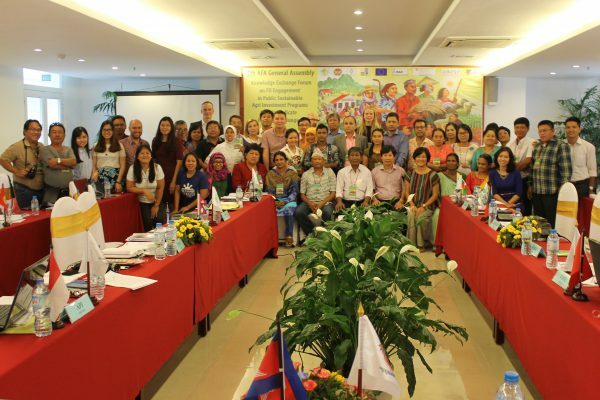 During this Regional Consultation on Seeds in South and Southeast Asia, organized in cooperation with the Vietnam Farmers Union (VNFU) and AsiaDHRRA, farmer- and producer organizations from seven countries in the region discussed the main challenges with regard to access to seeds. Notably climate change, low quality of seeds and lack of capacity to conserve and produce quality seeds were identified as important challenges. Following a presentation of the Access to Seeds Index, farmer representatives engaged in a discussion on where and how seed companies could play a role in addressing these challenges. According to the participants, companies can play an important role in improving access to quality seeds. But they underline that farmers themselves also have a crucial role in production and conservation in community-based initiatives. A larger role for companies and government regulation should not restrict farmers rights and opportunities to produce and conserve themselves. More information on the meeting can be found here. A report of the meeting can be found here.